Care Instructions: Measurements for the ponchos are taken across shoulder and from edge of shoulder to the edge of the V. Measurements also includes the fringe where applicable. 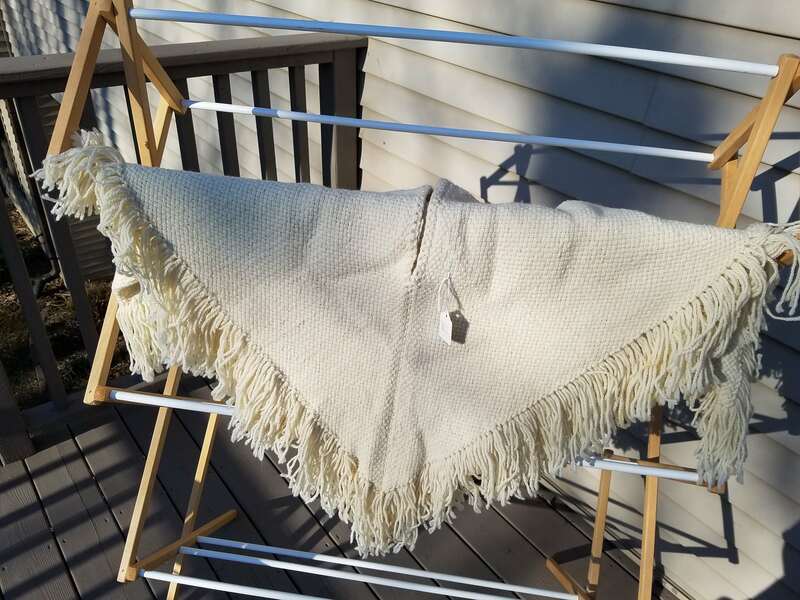 •	All cotton dish towels can be machined washed with cold water and dried in the dryer. Repeated washings will actually make the towels softer and more absorbent. •	Cotton placemats should be hand washed in cold water and laid flat to dry. However, they can be machined washed on gentle with cold water and laid flat to dry. 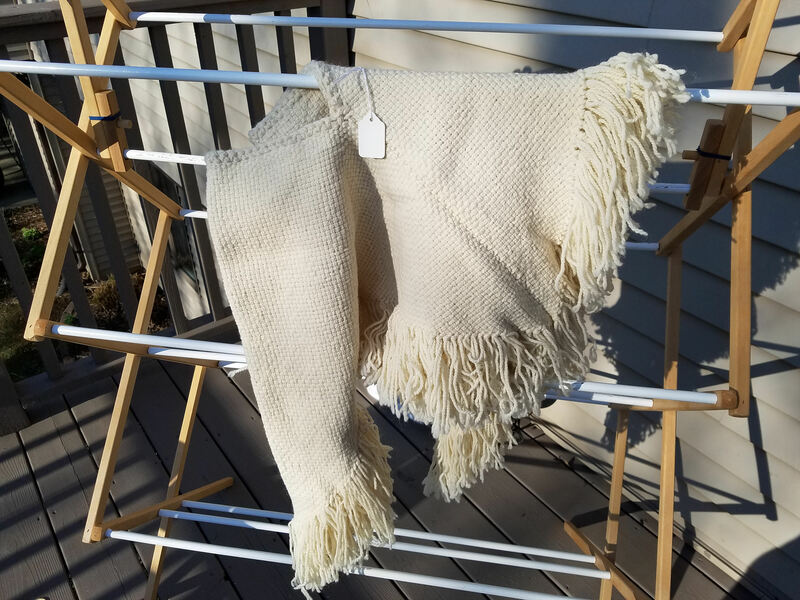 •	All scarves, shawls, ponchos, and knitted hats should be hand washed with Woollite and cold water, and then laid flat to dry. •	For all other woven or felted items, please spot wash with cold water or dry clean only. This is to keep the shape and or size of your items. I strive to bring you unique high quality products. However, these are all handcrafted and made from high quality natural materials, so there will be slight variations. These variations can be in size, shape, weight, and color. I always try to support small sourced yarn shops from throughout the world. These yarns are usually hand dyed in small lots, so color variation is a possibility. However, that variation adds to the uniqueness of your item. Where needed, I will mix some acrylics in with natural materials, such as sock yarn needs elasticity, or some fragile wool yarns need to be combined with a good acrylic, to keep its shape without stretching. Do you not see the color, size, or item you want? Do not worry, I accept custom orders. When placing a custom order you must keep in mind that it will take me time to find the specific fiber in the specific color, order it, prep the loom and weave it and/or knit/felt the item. So I ask you to give me at least 30 – 45 days to complete your masterpiece. Throughout this time, I will send you (via email) progress reports. You will never be left in the dark! When placing the order, I will require you to give me 50% down payment. This payment will be made through a clickable object within the store. This object will have 50% of the cost of your custom listed. Once your masterpiece is finished, will email you to let you know. Again, you will be asked to pay the other half of the cost through a clickable object within the store. Once the final payment is received, I will email you detailed pictures before shipping, and then I will mail it out immediately for you to enjoy. Due to pricing differences and or limited quantities of some of the yarns I use, there may be a slight cost adjustment.